So you may have seen a bit of a theme here in Rocky's toy reviews on Life As Alice at the moment. We recently reviewed the My 1st JCB - Big Wheeler Joey, much to the shock of a family member who works for their main competitor CAT. After a bit of light hearted banter on social media, he decided to send Rocky some of CAT's toy's to compare and review, to see who's is best. He has obviously risen to the challenge, like any toddler offered toys would. 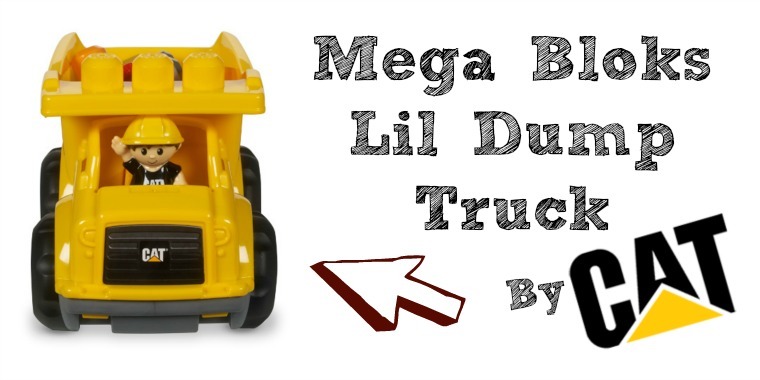 The Mega Bloks CAT Lil' Dump Truck comes with 6 of it's own Mega Bloks and it's very own mini construction worker figure and it is just the job for your young, wannabe builder. 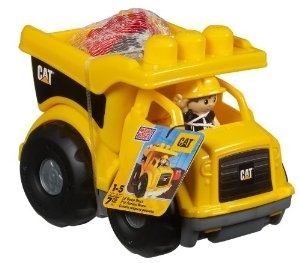 The brightly coloured truck includes: Moving wheels and tipper compartment, an open driver's cabin for easy play with the removable builder figure. The Mega Bloks bricks included are of average size and work with other Mega Bloks products. They are suitable for kids aged 1-5. 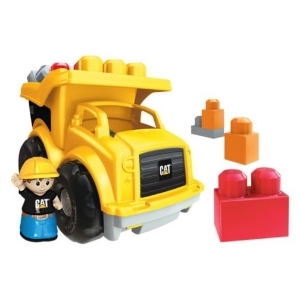 This toy is also compatible with all other Mega Bloks CAT construction products, so they can build a full collection for hours of fun outside and in. Rocky got really excited when he saw this brightly coloured truck coming through the door. Luckily the packaging was just a few ties and a netting to hold the Mega Bloks, making opening it really quick and easy, a must for impatient toddlers. The Bloks were an instant hit and were quickly stacked up on the dumper and being tipped out. He has lot's of Mega Bloks already so there were soon added extras involved in the play. 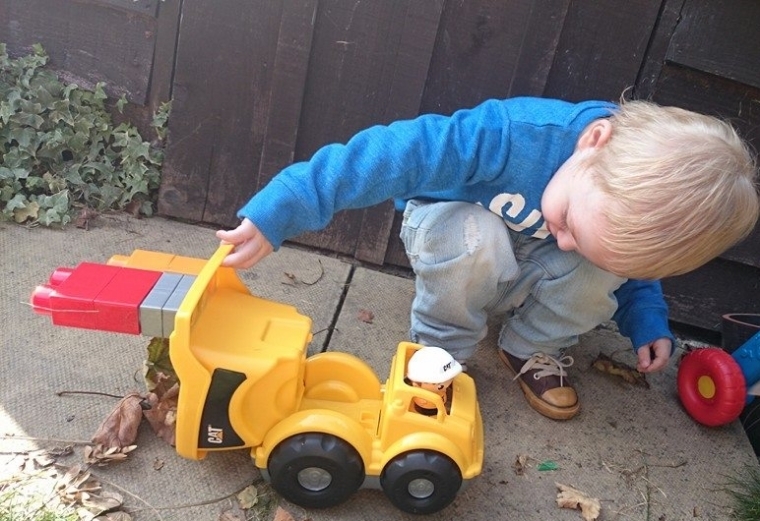 The truck itself was easy to play with too and after spinning the wheels around with his hands whilst flipping the dumper back and forth, he soon turned to the little construction worker figure in the drivers seat. The little man, we've named Steve, is a happy looking chap and he loved being tossed in and out of the dumper... honestly he did. Rocky has spent a long time playing with the truck outside, making the most of the nicer weather before it turns. It seems it is perfect for collecting the first autumn leaves that have fallen into our back garden, as you can see in the pictures above. I suspect it's also going to be great for stones, flowers and all sorts of outdoor collecting activities during each season. It seems to have kept him busy for a long time, which is always good. This toy is quite sturdy, very toddler proof and without small parts it makes it really simple to use for small fingers. He's pretty rough with his toys (think a less evil Sid from Toy Story) and so far it has managed to live through it. All in all, I'd say this was a great addition to any toy box and although a few pound more than the JCB one, the added Mega Bloks and driver make it more of an interactive and imaginative toy, which is well worth the little extra, especially if you have a Mega Bloks fan already. I think Santa has his eye on this one for stockings across the country this Christmas.